Scientists at the Okinawa Institute of Science and Technology Graduate University (OIST) have resolved a fundamental weakness in a promising solar technology known as Perovskite Solar Cells, or PSCs. Their innovations appear to improve both the devices' stability and scalability in one fell swoop and could be key to moving PSCs to market. Third-generation solar cells efficiently convert sunlight into usable electricity and cost less energy to manufacture than old-school silicon cells. PSCs, in particular, have garnered the attention of science and industry thanks to their low cost and high efficiency. Though their performance is promising in lab tests, the devices still suffer from low stability and cannot be produced commercially until they're built to last. "We need solar modules that can last for at least 5 to 10 years. For now, the lifetime of PSCs is much shorter," said Dr. Longbin Qiu, first author of the paper and a postdoctoral scholar in the OIST Energy Materials and Surface Sciences Unit, led by Prof. Yabing Qi. The study, published online in Advanced Functional Materials on December 13, 2018, supports prior evidence that a commonly used material in PSCs, called titanium dioxide, degrades the devices and limits their lifetime. The researchers replaced this material with tin dioxide, a stronger conductor without these degrading properties. They optimized their method of applying tin dioxide to produce stable, efficient and scalable PSCs. In experiments, the researchers found that tin dioxide-based devices showed lifetimes over three times longer than PSC devices using titanium dioxide. "Tin dioxide can give users the device performance they need," said Qiu. PSCs consist of layered materials, each with a specific function. The "active layer," made from perovskite materials, absorbs incoming sunlight in the form of particles called photons. When a photon strikes a solar cell, it generates negatively-charged electrons and positively-charged holes in the active layer. Scientists control the flow of these electrons and holes by sandwiching the active layer between two "transport materials," thus creating a built-in electrical field. To help usher electrons in the right direction, many PSCs include an "electron transport layer." Most PSCs employ titanium dioxide as their electron transport layer, but when exposed to sunlight, the material reacts with perovskite and ultimately degrades the device. Tin dioxide stands as a viable replacement for titanium dioxide, but before this study, it had not been successfully incorporated into a large-scale device. Using a common technique in the industry called sputtering deposition, the researchers learned how to craft an effective electron transport layer from tin dioxide. Sputtering deposition works by bombarding the target material, here tin dioxide, with charged particles, causing it to spray upwards onto a waiting surface. By precisely controlling the power of the sputtering and speed of the deposition, the researchers produced smooth layers with a uniform thickness over a large area. 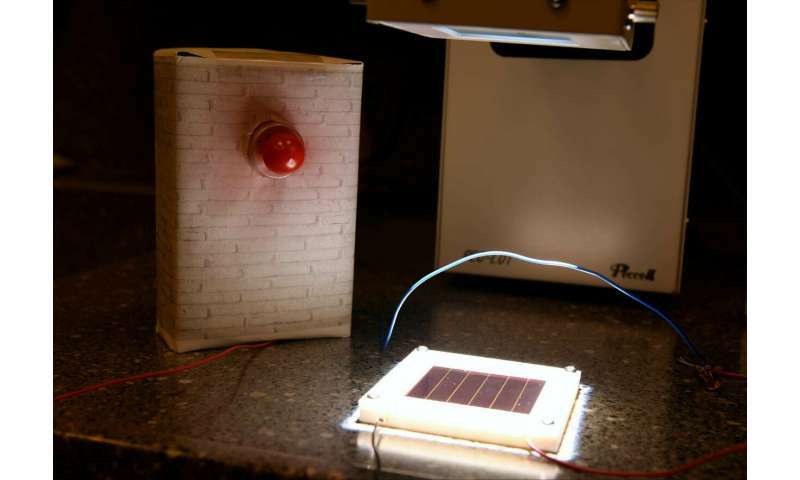 Their new solar cells achieved an efficiency of over 20 percent. To demonstrate the scalability of this new method, the researchers then fabricated 5 by 5 centimeter solar modules with a designated area of 22.8 square-centimeters, finding that the resulting devices showed over 12 percent efficiency. This research, which was supported by the OIST Technology Development and Innovation Center's Proof-of-Concept Program, represents a crucial step forward towards meeting the current industry standard for PSC efficiency. The researchers plan to continue optimizing their PSC design with the goal of producing large-scale solar modules with improved efficiency. 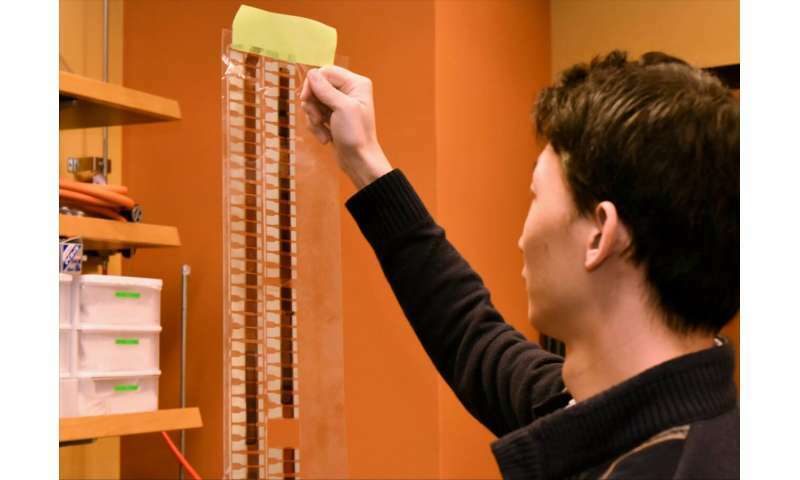 The research unit experiments with flexible, transparent solar devices and aims to apply their optimized PSC design in solar windows, curtains, backpacks and deployable charging units. "We want to scale these devices up to a large size, and though their efficiency is already reasonable, we want to push it further," said Prof. Qi. "We are optimistic that in the next few years, this technology will be viable for commercialization."